My partner and I try our hardest to remain calm about the fact we are seconds away from being flung into the sky. Picture care of Experience Oz. Does being flung into the air at 200 km per hour, whilst spinning 360 degrees and experiencing 6 G forces sound exciting to you? Probably not, but I can guarantee you it is just as crazy and amazing as it sounds. This is what you can expect when riding the Mooloolaba Missile, the newest attraction on the Mooloolaba Wharf on the Sunshine Coast. Similar to "Sling-Shot" rides you may have seen on the Gold Coast, the Mooloolaba Missile is certainly not for the faint-hearted, or those with a weak stomach. Although, Mr Rob Lee, owner of the Missile claims that in over a decade he is yet to see anyone be sick or faint from the overwhelming thrill. My partner and I went for the ride of our lives on the missile and the outcome was priceless (I'll leave the video to do the talking). I think I can safely say I have never held onto something as tightly as I did the frame of the missile. The view over Mooloolaba is magnificent, if you can manage to open your eyes. 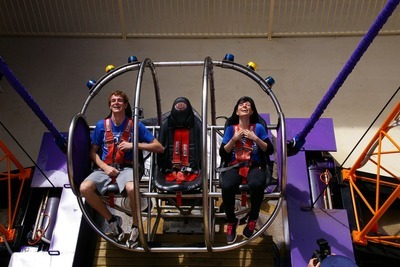 As my partner and I were one of the first lucky people to try out the new attraction, our experience was documented in the Sunshine Coast Daily Newspaper. The article can be read here. If your weekends are looking a bit dull and you are wanting to spice things up, being shot into the air in a reverse bungee style ride is certainly one way to do that. Rides are $25 per person and if you're feeling brave enough to go again you can for a further $10 if you remain strapped in. Visit the website for more information, or call 0410 694 773 to book. When: Daily, but you can call to make a booking. Cost: $25 per person, $10 per person for the second ride if remained strapped in.